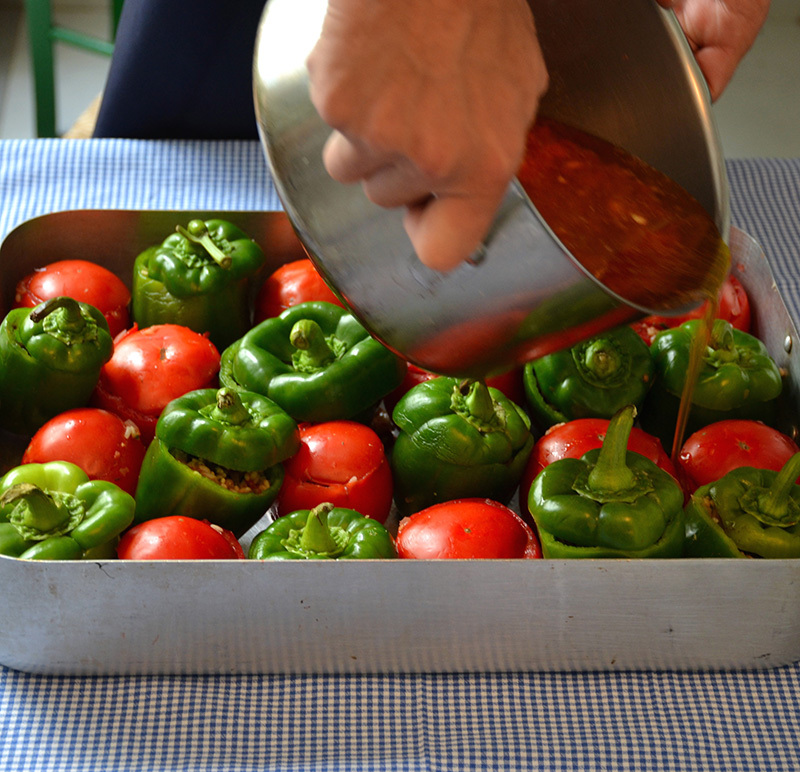 This traditional recipe is the symbol of Greek summer: Gemista. 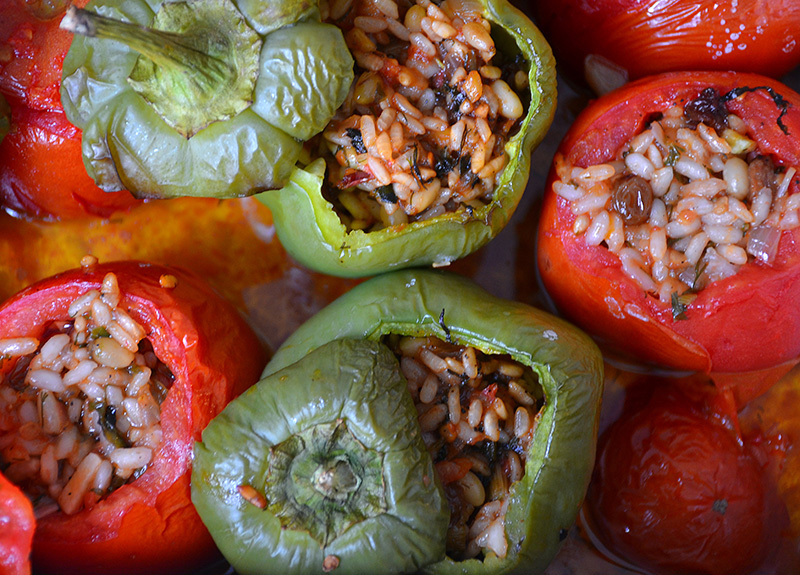 These stuffed tomatoes and peppers are so juicy, delicious and healthy, I love them! Gemista is a dish that comes from our fasting period and its totally vegan. It’s actually the favorite of the fasting period in the first 15 days of August. During this time the tomatoes and peppers are so deliciously ripened in the sun. The sun’s rays have made them full of sugar aromas and vitamins and have given them a beautiful color and taste. Every family has their own Gemista recipe and every island and region has its own variation. This is the recipe from my mother and our family here from Poros. It’s the most classic and typical of the Gemista variations in Greece. Gemista literally means stuffed. To make this dish you can stuff all kinds of vegetables. In the future you will find more Gemista recipes on Katerina’s Kouzina, not only with different variations to the vegetables, but also to the feeling. 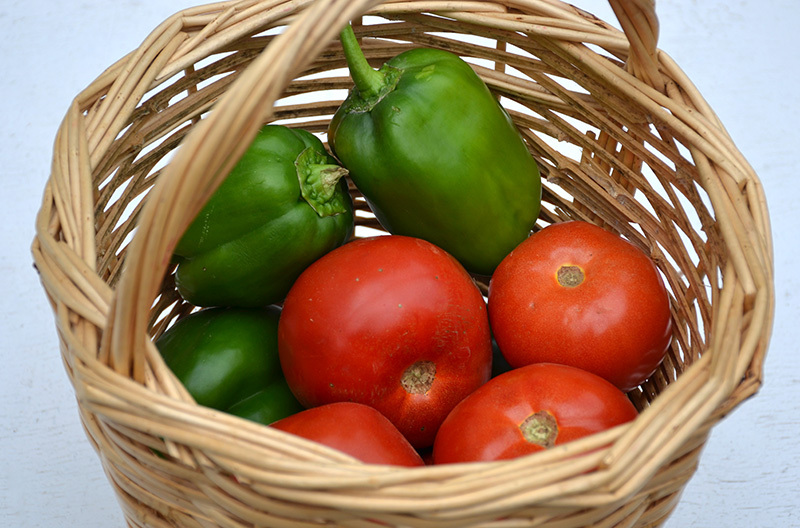 Now let’s get some of these deliciously fresh tomatoes and peppers and start cooking! Remove the pulp of the tomatoes and the ribs and seeds of the peppers. Put the tomatoes and peppers together in a baking dish. Prepare the stuffing with the rice, zucchini, eggplant, peppers, parsley, mint, raisins and the tomato mash. Don’t overcook it. The rice should not be soft, because it will soften later during the baking time. Sprinkle the tomatoes with some sugar. 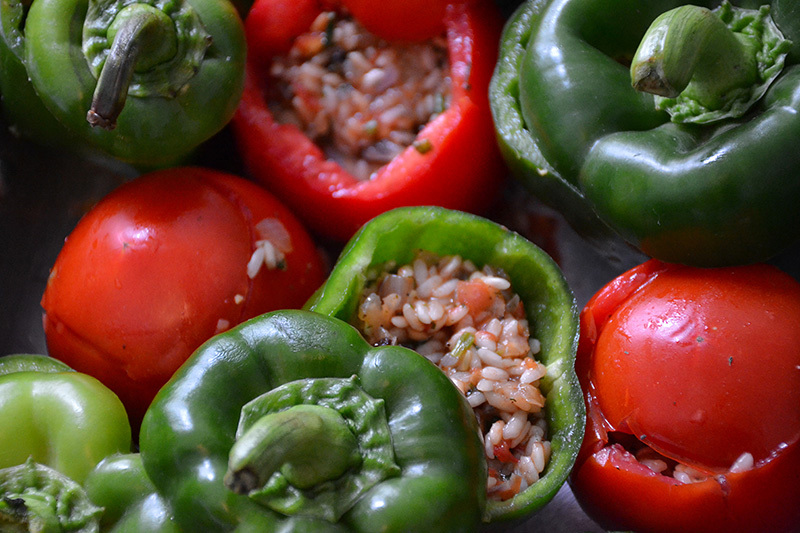 Fill the tomato and pepper shells with the rice mixture and replace the tops. Arrange the stuffed vegetables in a baking dish and drizzle them with a little olive oil, the rest of the tomato mash and some water. Bake them in the oven for 50 minutes. You can serve the Gemista warm or cold, however you like. Either way, I hope this recipe will make you taste the Greek summer! Wash 6 medium tomatoes and cut a thin slice from the top of each. Scoop out the pulp, leaving a shell about ¼ inch / ½ cm thick, and chop pulp coarsely, keep everything. 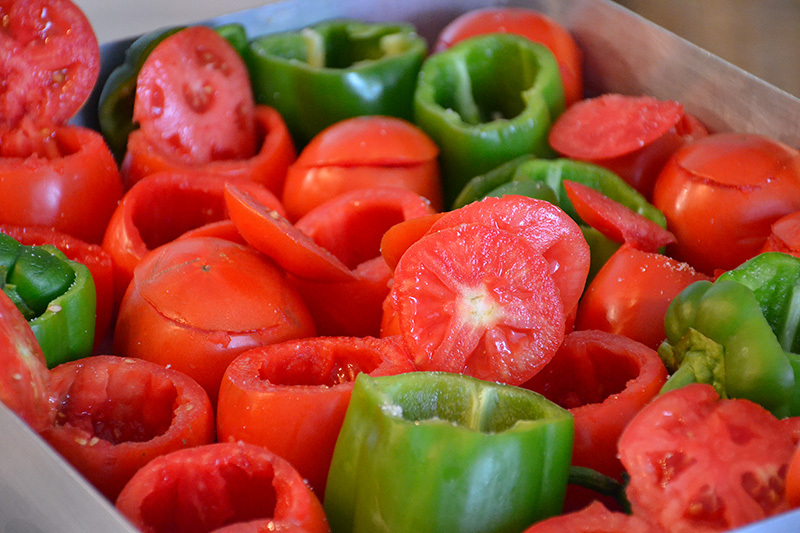 Wash 6 green peppers, cut off the tops and remove and discard the ribs and seeds. Keep the tops and shells of both tomatoes and peppers whole. In a pan, sauté 1 cup olive oil, the onions and garlic. Then sauté the zucchini, eggplant, and chopped peppers. 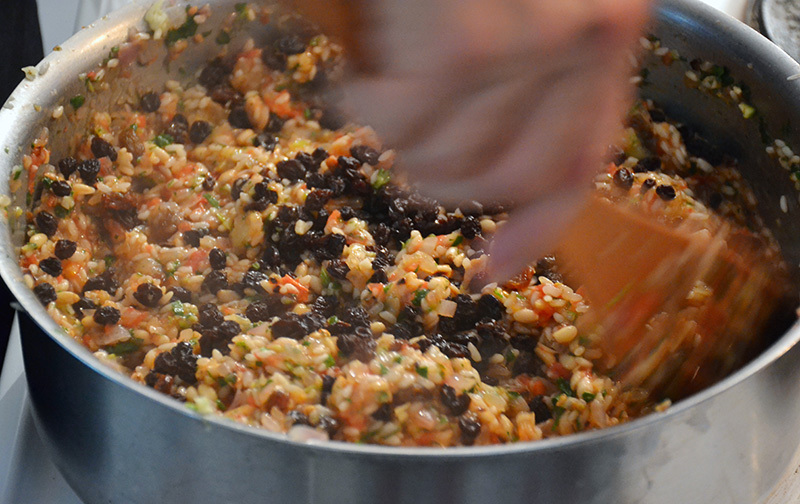 Stir in the rice, add parsley, mint, raisins and the half of the tomatoes mash. Add salt and pepper to taste. Do not overcook the stuffing. The rice should not be soft, it will soften later during the baking time. Sprinkle the tomatoes with some sugar. 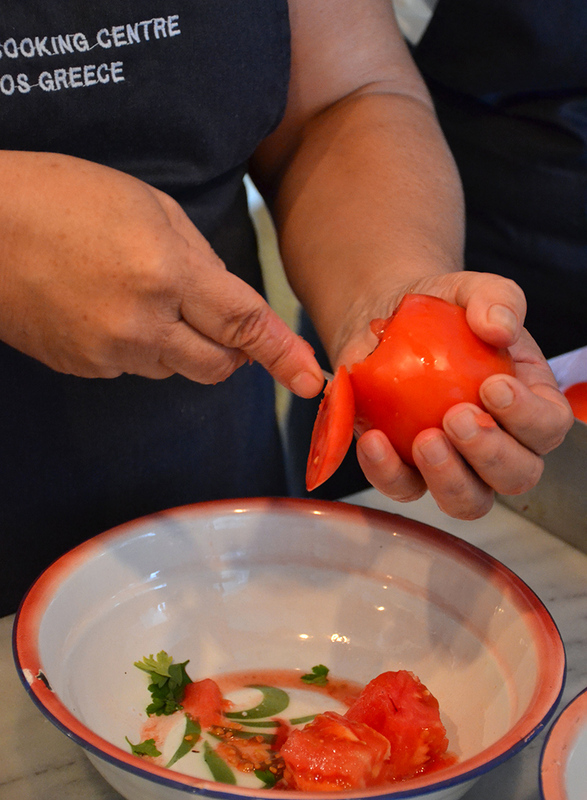 Fill the tomato and pepper shells with the rice mixture and replace the tops. Arrange the stuffed vegetables in an oven dish and drizzle them with a little olive oil, the rest of the tomato mash, and some water. Surround them with the chopped tomatoes. Bake in 180 C / 350 F oven (±50 minutes). Wait 20 minutes before you serve the Gemista. The next day it will always taste even better.